How Far is Namaha Lakewood? Namaha Lake Wood ia a gated community with 51 villas in 7 acres of land and premium villas and it is is located in the quiet neighborhood. The closest intersection is the APPA Junction. When approaching the property from Jubilee Hills it is situated off the Mehdipatnam – Langer house – Banglaguda (APPA Junction) Road which is Radial Road No:3. Deviation to be taken opposite Kalimata Mandir. Namaha Lake Woods is adjacent to AP Excise Academy and Army property. Namaha Lake wood is 14 kms from Banjara Hills, a drive of approximately 30 mins. It is 20 kms from the airport – NH7 junction. Srinidhi International School 5 kms, Glendale Academy (International School) 4 kms, Delhi Public School 11 kms, Oakridge International School 11 kms, Shadan Medical College 1 km, CBIT 11 kms, Vasavi Engineering College 8 kms. The closest intersection is the APPA Junction. Earthquake resistant foundation with RCC framed structure. To withstand wind and seismic loads for zone – II. Flyash / table molded brick. Surface luppam/ putty and painted with acrylic emulsion of approved colour and premium brand. Best Teak wood frame & shutter aesthetically designed with melamine matt polish fixed with door eye view /Imported Sandoor doors. Brass/ SS hardware with night latch, safety chain of superior brands like Dorset or Equivalent. matt polish and reputed make hardware/Imported Sandoor doors. Vitrified tiles flooring in Kitchen/utility and servant rooms and other Bedrooms and other Areas. Italian composite Marble in dinning, and drawing rooms. Vitrified titles flooring of standard make. Best quality acid resistant Anti skid designer ceramic Tiles dadoing up to 7’0” height. Provision exhausts fan and chimney. Provision for aqua guard, Telephone point in Kitchen area. Concealed copper wiring of standard make, in conduits for lights, fan, plug and points wherever necessary. Power outlets for Air Conditioners Hall, Dining, Living Room & all bedrooms. Power plug for cooking range chimney, refrigerator, micro oven, mixer grinders in kitchen. 3-phase supply for each unit and individual meter boards. Miniature circuit breakers (MCB) & ELCB for each distribution board. 100% back up with individual consumption Meters. Switches form Legrand company / or another Premium Quality. Shower enclosures in glass in Master Bed Room Bath. Provision Geyser in all bathrooms including maid’s Bathroom and kitchen including maid’s Bathroom. CP Fittings of superior band like Toto, Jaguar or equivalent in bathrooms and kitchen. Superior quality HDPE/PVC piping with special fitting as per relevant IS specification. All plumbing points will be pressure tested in accordance and required of the bureau of Indian Standards. Pneumatic water pumping system with Water treatment plant and Sewerage treatment plant. S S Railing / Duco paint finish or equivalent Glass for staircase and balconies. Cement Based tiles in Car Porch/ Patios / Drive ways. T V Point in all bedrooms, living room & family and dining areas. Provision for broad band connectivity to each Villa. xvii.NOTE: Changes in specification would be taken up at additional cost and feasibility. Namaha Estates, a joint venture of two reputed names in the construction industry – Trensdset Builders (P) Ltd. and Doyen Construction (P) Ltd. They have built some of the finest homes & apartments. Each is considered a benchmark in the city, and has earned the trust of customers. A reputation that isn’t easy to come by. A penchant for futuristic design and high quality standards has ensured a big following of happy and loyal clientele. 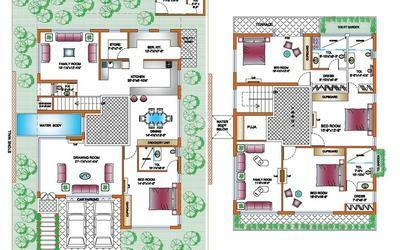 Namaha estates is one of the fastest growing Real estate company in Hyderabad. The company is promoted by people who have 25years of construction experience under the banner of Doyen Constructions and Trenset builders. Namaha estates is known for a superior Infrastructure business ethics and quality attitude. Its high level of integrity and dedication have made the company one of the most respected real estate developers. It is a pioneer in conceiving and executing large sophisticated real estate projects in both Apartment and Villa Projects, bringing together the unmatched experience & expertise . Namaha estates today, is the name that is associated with quality and reliability. namaha estates has completed 2 & 3 BHK apartments in Miyapur area dominating the neighborhood.Presently we have undertaken construction of villas in APPA junction and at Miyapur They showcase finest designs with quality construction. Elegant interiors, sun-lit spaces enhance warm relationships. Spacious balconies connect with outdoors for good times. Live in a brand new world knock the door of the future. A brand new world is awaiting to be discovered near Appa Junction and at Miyapur.